I embarked on my journey on Friday, July 5, at 10 pm with the other members of my youth group from the West Sayville church parking lot, and arrived with them back at the church parking lot on Friday, July 26, at 10 pm. In the course of that time period of exactly three weeks, an incredible number of exciting and edifying things took place, some of which I may write about later. 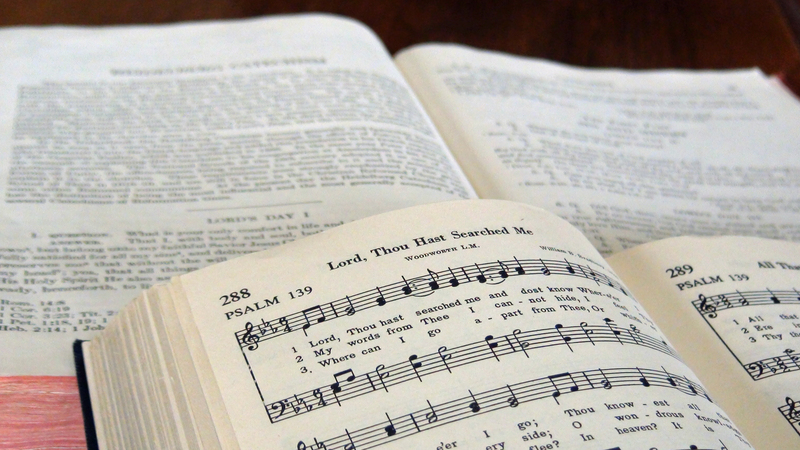 For now, however, it’s time to catch up on some sadly-neglected areas of URC Psalmody, beginning with our series journeying through the Heidelberg Catechism. We left off in our series on the Heidelberg Catechism with Lord’s Day 26, which introduced the first of the two Biblical sacraments: baptism. Lord’s Day 27 delves deeper into the nature of baptism with words of comforting instruction. 72 Q. Does this outward washing with water itself wash away sins? cleanse us from all sins. 73 Q. Why then does the Holy Spirit call baptism the washing of regeneration and the washing away of sins? A. God has good reason for these words. just as water washes away dirt from our bodies. is as real as physical washing with water. 74 Q. Should infants, too, be baptized? are in God’s covenant and are his people. and the Holy Spirit who produces faith. and should be distinguished from the children of unbelievers. which was replaced in the New Testament by baptism. “[H]e wants to assure us, by this divine pledge and sign, that the washing away of our sins spiritually is as real as physical washing with water.” The Reformed faith emphasizes baptism primarily as a covenant sign and seal, marking believers and their children as belonging to God and not to the world. Thus, while Psalm 105 says nothing specific regarding baptism or circumcision, it is perfectly appropriate as it calls us to behold the words and works of our covenant God. And judgments of His word. And made His covenant stand. With joy and thankful song. The baptism of an infant or adult is a joyous occasion for many reasons, but most of all it points to the continuation of God’s covenant with his people as he calls them out of darkness into his marvelous light. Psalm 111 is a song of praise in response to the Lord’s covenant faithfulness. My voice and of His glory sing. And righteousness His work displays. Revealing that the Lord is kind. The wealth of nations has conferred. In heaven above and earth below. Through endless ages sound His praise. It’s embarrassing that about three weeks have gone by since my last blog post. However, the past few weeks have been full of excitement and encouragement on a variety of levels. At the moment I’m enjoying a week in West Michigan between the Teens Actively Serving Christ project I mentioned previously and the upcoming Reformed Youth Services convention. There is something intangibly unique about mission trips like the one I just attended. Perhaps it is due to the encouragement of thirty brothers and sisters dwelling together in unity (à la Psalm 133). Maybe it also arises from the balance of spiritual instruction and real-life opportunities to live out our faith (à la Philippians 2). Or perhaps it is connected to our confidence that in Christ our labor is not in vain (à la I Corinthians 15). Whatever the case may be, I know that I always emerge from these projects invigorated and inspired in my Christian walk–and I know the same is true for many others as well. It was a blessing to spend eight days living and growing alongside these young fellow Christians, just as it was blessing to worship with the members of the Bethany United Reformed Church and to be generously served by their members even as we reached out to serve others. Someone who attended another recent TASC trip said to me, “If we weren’t eating or sleeping, we were singing.” While that may have been a bit of an overstatement in our case, music certainly played a prominent role in our free time. One TASCer brought a few Psalter Hymnals along on the bus ride from the church to the location of our day away at the end of the week (Saugatuck and then Holland State Park), and we sang psalms and hymns almost the whole way there…and back. During lunch we started somewhat of a “Psalter Hymnal Flash Mob” at a Panera Bread as we waited for our food. That evening the group stopped for dinner at a restaurant in a converted Christian Reformed Church building in Jamestown, and before we left, we rose and sang the third verse of “By the Sea of Crystal.” And at midnight, just as the youth group from New Jersey was preparing to depart, we sang “God Be with You Till We Meet Again” with lumps in our throats. The week ended with sadness that our newfound “family in the Lord” would have to part ways, but also with confidence that our separation would only be temporary. All in all, I am firmly convinced that the most important aspect of Teens Actively Serving Christ is that it inculcates in us what Paul Tripp calls a “forever mindset.” Work never ends, friends move away, and even the best vacations come to an end. But a week like this reminds us that this world is not all there is. We serve Christ in hope–not a wishful sentiment but a steadfast sureness–that we will someday behold him face to face, enjoying the eternal rest spoken of in the Heidelberg Catechism along with all of our brothers and sisters in the Lord. May that realization grip us throughout our pilgrimages on this earth. Having shared those incidental thoughts on my recent TASC trip, the true purpose of this post is to alert you that it will probably be another two weeks or so before URC Psalmody can return to some kind of schedule. What lies ahead is a few more days of rest and fellowship, one more Lord’s Day spent with the saints in Michigan, then a bus ride to St. Paul for the 2013 Reformed Youth Services convention!